What causes Pancreatic Cancer in Humans? What are Pancreatic Cancer Causes? Even though there have been great strides in technology, there are some things in science and medicine that continue to elude us. Pancreatic cancer causes are still a mystery for the most part, as are any causes of cancer for that matter. Researchers have grasped an understanding of how cells and genetics work, however, and have identified certain behaviors that seem to increase a person’s chances for developing pancreatic cancer. Doctors still don’t know what specifically causes some people to develop pancreatic cancer, but there are things about the disease that they do know. Essentially, pancreatic cancer is caused by damage to the DNA, or mutations. Each cell in our body carries a chemical composition of DNA that carries our specific genes, and is responsible for telling our cells how to function. When the DNA in a cell gets damaged, the cell doesn’t follow the instructions anymore. It behaves abnormally and starts multiplying at a rapid rate and grows out of control. This eventually causes a tumor to form in the area of the damaged cell(s). There are three ways DNA can become damaged. First, we can inherit an already damaged gene. In other words, we inherit one set of genes from each parent, giving us two copies of each one. If we receive one copy of a cancer-related gene that is damaged and somehow damage the one good copy we have, then it’s likely that the two bad cells will form a cancer. DNA can also become damaged as a result of either smoking or chemicals in our environment or food. Lastly, the body may make a mistake replicating the DNA when the cell divides. Anything that may influence a person’s chance of getting cancer (or any other disease) is considered a risk factor. Each of the different cancer types can have their own set of risk factors. Things like age, race, gender, family history and occupation are all factors that can influence a person’s risk for pancreatic cancer. Almost 90% of patients who develop pancreatic cancer are over 55 years old. African-Americans have a higher-risk rate, and pancreatic cancer is more common in males. Working around certain chemicals, dyes and pesticides may also increase the risk factor. People who develop pancreatic cancer have been found to have more risk factors present than people without pancreatic cancer. Between 5% and 10% of those diagnosed with pancreatic cancer were found to also have a close family member that also has the disease. Statistics show that on average, 1 person in 76 will develop cancer of the pancreas. 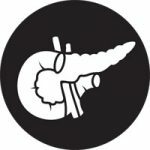 Other factors that can add to a person’s risk of developing pancreatic cancer include: use of tobacco products, obesity and lack of physical activity, and a high-fat diet. Genetics also plays an important role in pancreatic cancer causes. Pancreatic cancer is a mysterious disease and is still being aggressively researched. Although a person has no control over their genetic disposition, there are other things that can be done to reduce our risk factors. Taking proper care of our bodies by eating a healthy diet with plenty of vegetables and fruits and exercising is highly recommended.